Serigraphs by Jeff Sax from livenetworks artist series on Vimeo. For further info and purchase prices, please contact jeff@dagga.org or call (831) 372-2025. While reading about large vegetarian animals Jeffrey Sax came across the little publicized fact that Teddy Roosevelt killed Pandas on a hunting trip to China. The killed bears were brought back to New York City where they were stuffed and presented in diarama's at the Natural History Museum. They were instantly popular and the first "Teddy Bears" were born. 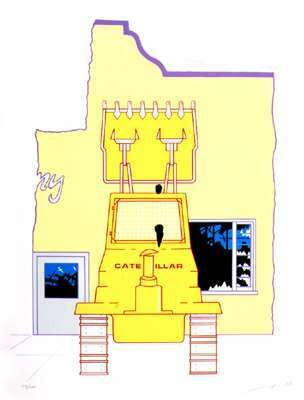 This serigraph represents a role reversal. The Panda is holding a doll-like child as a child would hold a cherished toy. The ideal is that the bear will not hurt the child (doll) and when the child grows up, it will not hurt the bear. A theme of mutual respect between man and animal, (Vegetarian) and East and West, (Political and Cultural). The characters in the upper left are Chinese for "White Bear" balanced out by the western letters for Panda. 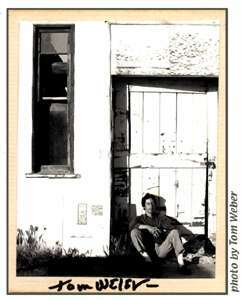 In 1985 with the help of art publisher David Perlmutter, Jeffrey Sax bought a printing press and set up shop. This serigraph is the first and only print that Panda Press completed. 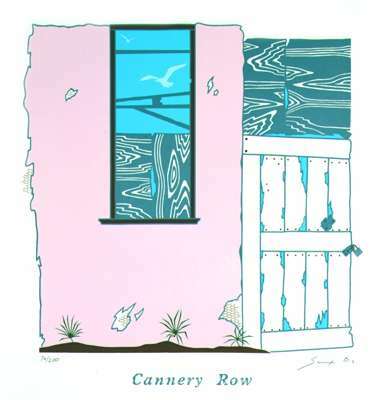 #1 Cannery Row-Jeffrey Sax opened his studio/gallery on Cannery Row in 1982. During that time and several years before, the old derelict fish canneries were the day and nighttime haunts of artists, passionate drinkers, young lovers, students, and various other adventures. One had to merely push their way through a cracked door to enter, at your own risk, a world of abandoned industrial decay and beauty. The old conveyor belts were rusted and scattered, roofs were blown off, and large holes in cement floors revealed the pounding surf 20 feet below. These former slaughterhouses of fish were now themselves being consumed by the sea. It was a place where time stood still... Behind this pink facade was a world left alone... a time of reflection... This was one of the first self-published serigraphs the artist commissioned from Art Montgomery, using a moped as a down payment. 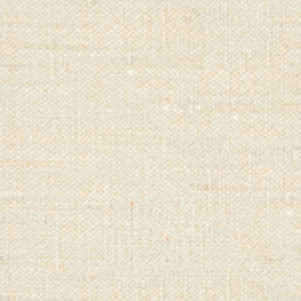 A small number of artist's proofs are missing the sea gull through the window. One year after publication this print found its way into a show at the Cleveland Museum of Art. Jeffrey Sax was one of the few living artists represented amongst such notables as Picasso, Warhol, Che'ret, Arthur Rackham, to name a few. 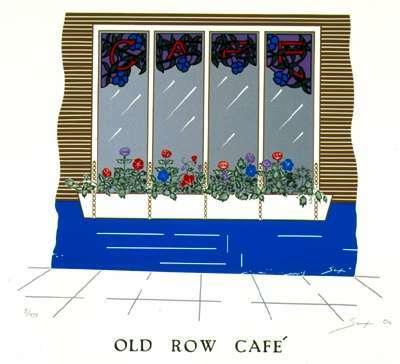 #2 Old Row Cafe-This restaurant was below the artists Studio/Gallery. 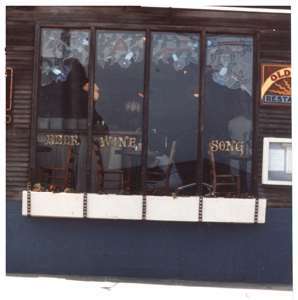 Joe Rombi had started small and was growing with the times. It was when small business people were converting the old canneries into retail adventures. Joe's dad, Grank, salvaged old tin siding and nailed sardine cans to the roof for ambience. Tourists were coming to see John Stienbeck's dramatized version of Cannery Row, only to find an eclectic group of small businesses, including a pillow theater that jutted out over the bay, and the usual remains of the old canneries. Every summer a small marijuana plant would sprout in the planter box. It was fun to see how large it would get before someone would discover and pluck it. 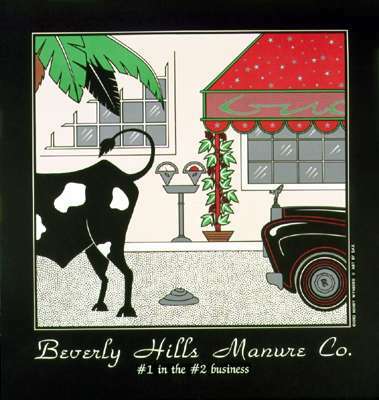 The Beverly Hills Manure Co. 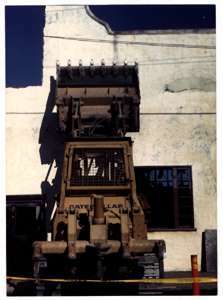 The Beverly Hills Manure Co. was founded in 1983 by Henry Wynberg.